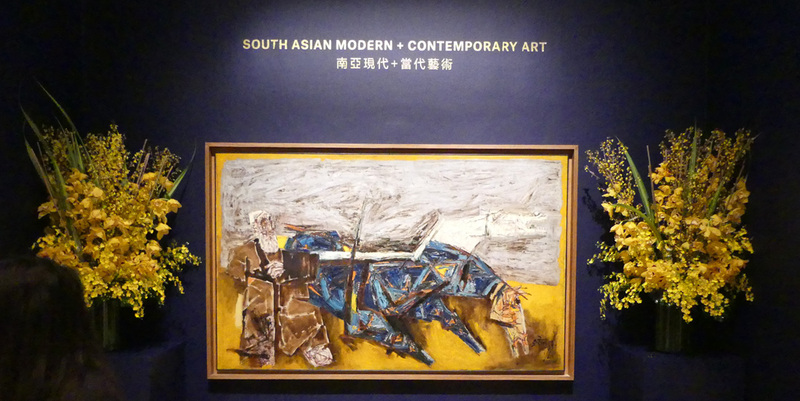 This March 20, 2019 auction at Christie's New York of South Asian Modern + Contemporary Art is highlighted by several works by Maqbool Fida Husain and a large triptych by Arpita Singh. 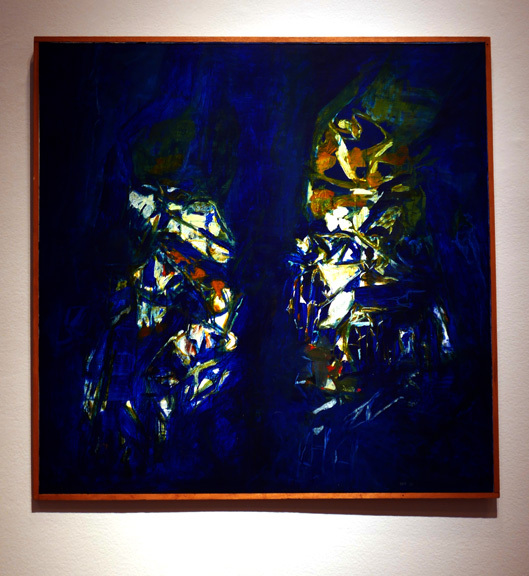 Lot 480, "Ashvamedha," is an impressive and very colorful oil on canvas by Arpita Singh (b. 1937) that is a triptych that measures overall 60 by 108 1/2 inches. It was painted in 2008. "Arpita Singh was born in Baranagar in West Bengal before the partition of India in 1947. She studied at the School of Art, Delhi Polytechnic, and after graduating, worked as a designer at the Weavers Service Centre in Calcutta and New Delhi. Over the years, Singh developed a highly distinctive visual language typified by a rich layering of color, strong brushwork and the employment of suggestive metaphors and motifs. "Her experience as a weaver influenced the evolution of her artistic vocabulary as well as her creative process. In particular, many of her paintings utilize the principles and methods of Kantha, a Bengali embroidery and textile-based storytelling form practiced primarily by women weavers in rural areas. In the Kantha style, her paintings consume the entire canvas, depicting scenes from daily life, and her brush strokes resemble Kantha stitches on fabric. Western artists like Marc Chagall and Henri Rousseau have also been an influence. For instance, Singh’s depiction of ungrounded figures in an abstract space are reminiscent of Chagall’s floating figures. "Singh's figurative compositions often address challenging social and political subjects. They are a direct reflection of her life experiences as well as her thoughts and ideas on political issues like female identity, displacement and violence....The present lot, a large triptych titled Ashvamedha, was an integral part of Singh's solo show ‘Cobweb’ at Vadehra Art Gallery, New Delhi in 2010. Here, the artist appropriates the ancient myth of Ashvamedha or ‘horse sacrifice’, a Vedic ritual in ancient India in which a stallion was selected and allowed to roam freely for a year under the protection of royal guards. If the horse entered a foreign country, its ruler had to either fight for the horse or surrender. If the horse was not captured during the year, it was brought back to the kingdom and then sacrificed in a public ceremony. By referring to this myth, the artist alludes, perhaps, to both childhood memories of communal violence and the particular violence perpetrated on women. "Painted in tones of blue, pink and green, this work from 2008 appears like a Cartesian map of an unknown (and unknowable) geography. On the map are overt even playful motifs that reference death, migration and violence: men in military uniforms holding guns, naked, skeletal female figures, men riding horses as if on a battlefield and other aggressors on motorcycles. 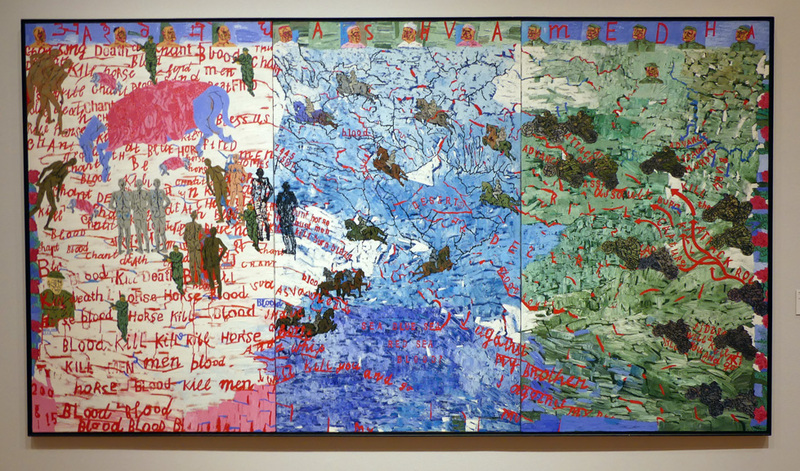 Singh also dots this painting with recurring letters and words in bold red that literally refer to the themes of death and migration. This repetition of images and words is a fundamental part of her artistic method and can be traced back to her entirely abstract phase in the 1970s. During this period, she created drawings using ink, charcoal, watercolor and pastel where she laboriously repeated basic marks like dots and lines on paper. When she moved back to painting, she often used repeated strokes to create backgrounds and repeated motifs in different positions. In Ashvamedha, repetition is a device used to indicate the urgency of her key themes and the looming menace of violence. The painting has a vibrant aesthetic but the profundity behind the narrative and its darker allusions is revealed on closer inspection." The lot is from the collection of the Glenbarra Art Museum in Japan. It has an estimate of $250,000 to $300,000. It sold for $287,500 including the buyer's premium as do all results mentioned in this article. The sale total was $5,842,625. 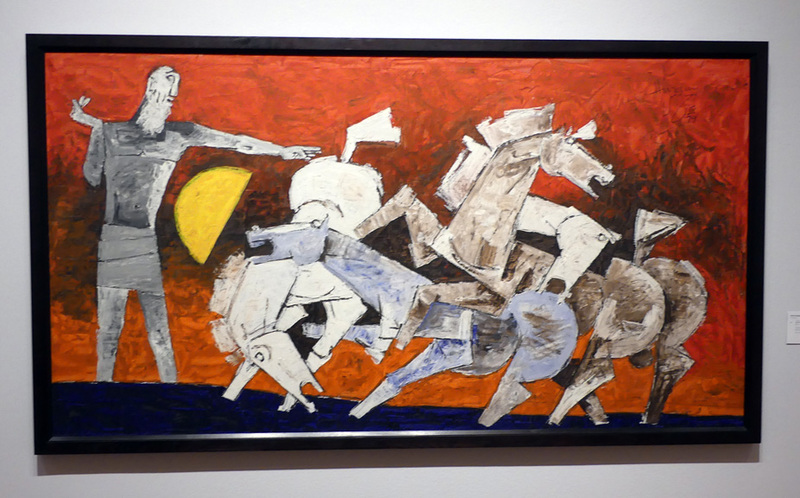 The cover illustration of the catalogue is Lot 416, an untitled oil on canvas of horses by Maqbool Fida Husain (1913-2011). 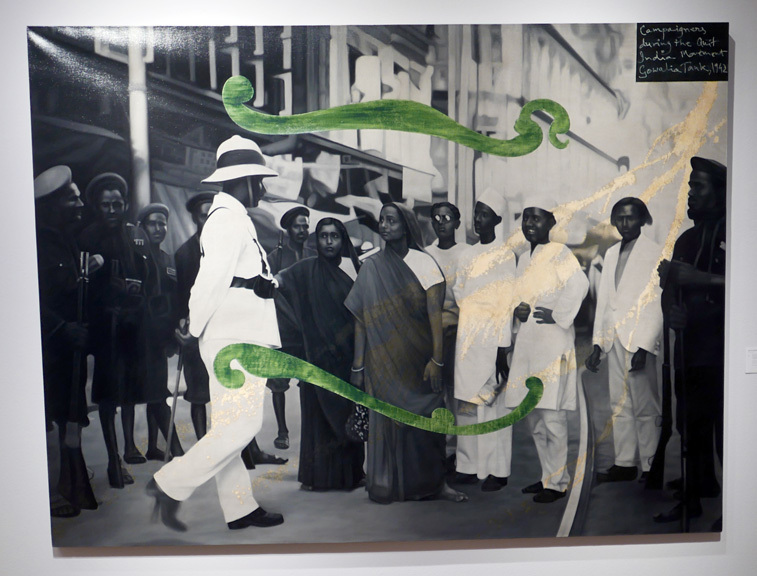 It measures 50 by 81 inches and was exhibited in 1969 at the Bombay Gallery Chemould, Jahangir Art Gallery. It has an estimate of $700,000 to $900,000. It sold for $1,035,000. In this large work, painted in 1979, the bodies of four bucking and rearing horses are dramatically intertwined against a backdrop transforming from fiery orange to deep crimson in the light of the setting sun. While the animals seem eager to chase the sun as it dips below the horizon, they wait for sanction from the larger-than-life male figure who stands in front of them, reminiscent of Husain’s grandfather, Dada Abdul, who appears in several of the artist’s autobiographical paintings. Bearded and prophet-like, he effortlessly controls the raw power of these dynamic beasts, able to halt, channel and release it at will. In addition to its animated composition, the scale of this painting endows it with a theatricality that may be traced to Husain’s long association with cinema and his first job as a painter of cinema billboards in Bombay. Aided by the artist’s vivid and starkly contrasting palette, this monumental painting succeeds in creating a sense of awe and reverence in the viewer. It has an estimate of $180,000 to $250,000. It sold for $447,000. 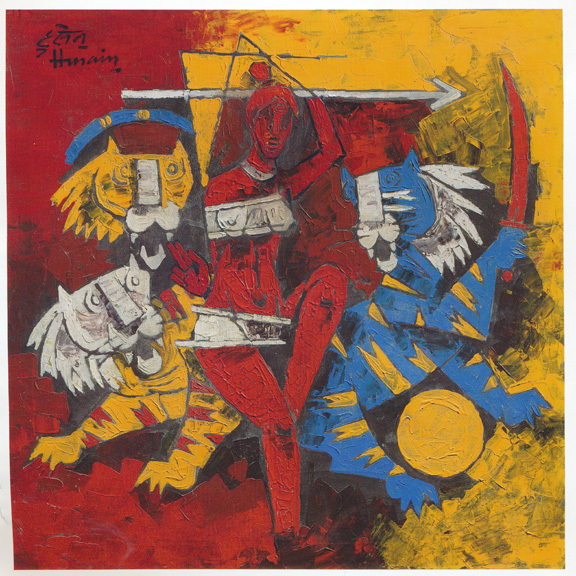 Lot 456 is a colorful and very vibrant oil on canvas by Husain entitled "Untitled (Durga)". It is 34 1/4 inches square. "Icons from Hindu religious texts and mythology were a recurring theme in Maqbool Fida Husain’s paintings. The artist started painting Indian gods and goddesses, reconfiguring them with his unique visual vocabulary as early as the 1950s, and has been both praised and criticized for these portrayals. This painting of a female warrior in red, riding a tiger and brandishing a spear, is likely inspired by traditional depictions of the Goddess Durga. In Hinduism, Durga, also known as Shakti or Devi, is the protector of all that is good and harmonious in the world. She is usually portrayed in painting and sculpture riding a lion, with her multiple arms holding different weapons. It is also believed that Durga was created by the Hindu triumvirate or trimurti consisting of the three gods, Shiva, Vishnu and Brahma to slay the buffalo demon Mahisasura. "The present lot underlines Husain’s virtuosic ability to synthesize classical Indian aesthetics and aspects of European Modernism, a hallmark of his inimitable and acclaimed style. His use of a bright color palette comprising hues of red, orange and yellow along with heavy impasto conveys movement and gives this powerful female figure emotive energy. Husain was strongly influenced by depictions of Indian mythology in classical painting and sculpture as well as by the styles of Mughal, Jain and Basholi miniature paintings. "This painting also highlights the artist's interest in depicting women as protagonists in his work. Throughout his extensive career, Husain portrayed female figures as heroines in the semi-abstract modernist style he is known for, inflected with Indian characteristics without being in the least parochial. Here, Husain's subject is both goddess and everywoman, combining the mythical and ordinary in the artist's characteristic style." It has an estimate of $50,000 to $70,000. It sold for $187,500. Lot 475 is a large digital print by Seher Shah (b. 1975) that is entitled "Monumental Fantasies - Impermanence." It measures 54 by 120 inches and was created in 2008. "Here, the title refers to the illusive stability of history, emphasizing interactions between shifting spaces rather than the intrinsic meaning behind them. In this work, the looming monumentality of public memory converges with the intimacy of the individual. The subtlety and intricacy of the linear patterns directly confronts the overwhelming emptiness of the black voids and stands in distinct contrast to the scale of the work. The starkness of the white lines against the background, combined with the large format of the work, creates a sense of theatricality and spectacle unique to Shah’s practice. "Trained as an artist and an architect at the Rhode Island School of Design, Shah initially joined an architectural firm specializing in large-scale urban projects. Reflecting this background, her drawings appear to be born from the amalgamation of architectural techniques and artistic sensibility. The composition of Monumental Fantasies- Impermanence I takes the form of an urban skyline dotted with structures superimposed with silhouettes of people that look like sculptural portrait busts. National and cultural symbols such as flags, mosque-like domes and images of angels merge fluidly into the lattice patterns, hinting at the evocative sociopolitical imagery underlying her practice. "Shah’s work is soon to be featured in a major group show at Jameel Arts Centre, UAE (March 2019), and has previously been featured in several international exhibitions. Her work is included in several international institutional collections including those the Museum of Modern Art (MoMA) and the Brooklyn Museum in New York, and the Devi Art Foundation in Delhi." The lot has an estimate of $25,000 to $35,000. It sold for $30,000. Lot 476 is a very large oil, acrylic with marble dust and oil stick on canvas by Atul Dodiya (b. 1959). It is entitled "Campaigners During the Quit India Movement, Gowalia Tank - 1942." It measures 72 1/4 by 96 inches and was painted in 2014. "Atul Dodiya’s vast body of work defies categorization, seamlessly blending a range of mediums and styles. His large-format narrative paintings often engage with various historical and sociopolitical happenings in India. Campaigners during the Quit India Movement, Gowalia Tank - 1942 is one of a series of photorealistic paintings by Dodiya in which he recreates historical images from various events leading up to Indian independence. Gowalia Tank in Mumbai was originally a water tank where cows were bathed, deriving its name from the Marathi term for cattle owner. This site continues to exist today as a popular garden, but also represents a significant moment in the history of India’s independence movement, as the place where Mahatma Gandhi delivered his ‘Quit India’ speech on 8 August, 1942. Gandhi’s call for the nation to “Do or Die” mobilized the citizenry and ignited a nationwide civil disobedience movement. "In choosing an image that depicts women participating in the freedom movement, Dodiya turns his lens onto the masses as a key force in the resistance to British rule. The animated swirls of color the artist overlays on the image disrupt the stillness of the original photograph, recalling the dichotomy between nonviolent activism and the turbulence of the freedom struggle and adding an additional layer of coded historical references in Dodiya’s work." The lot has an estimate of $25,000 to $35,000. It sold for $56,250. Lot 433 is a strong abstraction by Syed Haider Raza entitled "La Mer." An acrylic on canvas, it is 48 1/4 inches square and was painted in 1974. "By the 1960s, Raza’s oeuvre became a perennial dialogue between East and West, and it was his unique synthesis of these that allowed the artist to develop his innovative, emotive style of landscape painting. Another artist who moved to Paris the same time as Raza was the Chinese painter, Zao Wou-Ki. Like Raza, he would also negotiate a dialogue between the Eastern and the Western avant-garde. Zao Wou-Ki's traditional training in Chinese painting and calligraphy, and his colorful abstract landscapes uniquely and deftly bridged the East and the West, expressing dynamic movement and balance comparable with Raza's works of the same period. "Painted in 1974, La Mer is an important painting from a key period in Raza's career, when, after many years of working within the style of the École de Paris, his artistic path brought him full circle and he began to integrate vital elements of his Indian childhood and cultural heritage into his paintings. A substantial body of works from this period that bear the title La Terre, or 'the earth', and the present painting titled La Mer, or 'the sea' offers a critical counterpoint. Rather than looking to the nostalgia of the forests of Madhya Pradesh, Raza here looks at their analogue in the open waters, which seem simultaneously inviting and darkly choppy. "La Mer exemplifies Raza’s expressionistic use of color and spiritual and symbolic engagement with nature, its principal elements, and the notion of creation. For the artist, nature had become a source of power that could not be portrayed in traditional landscapes. Instead, it was the emotion that each scene inspired in the artist that had to be captured through his vivid palette and gestural brush strokes. Here, the artist's use of primary colors and energetic brushwork helps create a captivating seascape that draws the viewer further into its depths with each encounter." The lot has an estimate of $200,000 to $300,000. It sold for $250,000. Lot 425, "The Shore," is an oil on canvas by Ram Kumar (1924-2018) that is 32 5/8 inches square and was painted in 1961. Marking his stylistic evolution from figuration to abstraction, the landscape of Varanasi influenced the artist’s oeuvre for over forty years. Painted only a year after his first visit to this holy city, The Shore expresses the deep melancholy of the city and sublimates its spectral beauty through its simple yet poignant composition. It radiates a unique sense of stillness, with subtle rays of cold, blue light emanating from pure shades of grey. The city seems suspended in the silence of dawn when its riverbanks are only animated by the movement of the dark river. Describing how his use of color replaced all human presence in these compositions from the early 1960s, Kumar explains, "I understood colour for its syntax of transparency; I combined its foundation with the divisionism applications of pure colour and moody atmospherics. The landscape has now for me become the dynamic form of a layered experience of perception as well as memory, in which the elements of the landscape appear to merge into surroundings, and the human experience is felt more by its absence as well as the little inclusions of colour that I want to bring to the canvas.” (Artist statement, U. Nair, Ram Kumar – The Isolatory Quest, exhibition catalogue, New Delhi, 2005, unpaginated). The lot has an estimate of $60,000 to $80,000. It sold for $106,250.